Of course, that kind of attitude has been consigned to history, now, hasn’t it? Anyway, it is a lovely town, this town that I am referring to, full of historical buildings associated not only with the British, but also with Indians (of course), Nepalese, Tibetans, and several other races. For this reason, amongst others, it attracts a goodly number of tourists, Western and otherwise. One day I sat eating breakfast in a restaurant there, when a group of five other Westerners entered and sat down at a table nearby. Within about half a minute, they had begun to complain bitterly to each other about their travels. They appeared to think that the whole world was a freak show, put on for their benefit as they travelled around viewing it, but everyone that they met in these backward places (‘I don’t miss Western civilisation at all.’ Remarked one of them, whilst playing with his i-phone) were either out to fleece them, or to thwart their plans in some way or another by pretending not to have what they were asking for, or by taking ages to do what was demanded of them. However, I was distracted from listening to their conversation and wondering how best I could kill them all without being arrested, by the arrival of another Western lady, aged, I would think, about sixty, dressed in a slightly odd mix of Indian and Western dress. She had appeared the previous morning in the restaurant, and had a shouting match with the same group of Westerners, although I had been on the other side of the restaurant that morning and could not understand what it was about. ‘Thank you.’ I replied (I was in t-shirt and trousers, nothing particularly priestly). ‘No, I’m not.’ Our conversation continued for about ten minutes. She was a Plantagenet royal, brought to 2013 by a time machine, which the CIA discovered in 2000. That is why so many people are unhappy; they have been sent away from their proper times. She apologised for not being able to hear very well, although I could see no problem in that respect, but she had been hypnotised. Then she wished me goodbye and went out again. What a splendid woman. She was a breath of fresh air, and unknowingly saved the lives of five other Westerners that day just by being there. Perhaps we should all be made to stay at home. It was quite interesting being there! What a great couple of anecdotes! I found the bit about disposing of the loudmouths was especially hilarious. Why is there never a crocodile pit when you need one, eh? Regrettably, the crocodiles were full by then. It would be so much cheaper for them to stay home and hate everyone there, but I’m sure they think travel broadens their horizons. Or minds, if they have any. Or–oh, hell, all their friends are doing it so there must be some reason. Yeah, but unlike the idiots you’re talking about, you’re saying something worth hearing. Or, well, reading. One does wonder why someone would travel only to complain. Thanks for visiting my blog. Hi Margo. Yes, you wonder. I always feel grateful for the opportunity to visit somewhere new, even if it is not what I expected it to be. Often, that is the joy of it, after all. Thanks for dropping by. Interesting incidence! Did this take place in shimla? And those old pictures are lovely. The labourer in picture reminds me things were prettymuch same till ten years back in mussoorie, shimla and nainital. I don’t know of current situation. 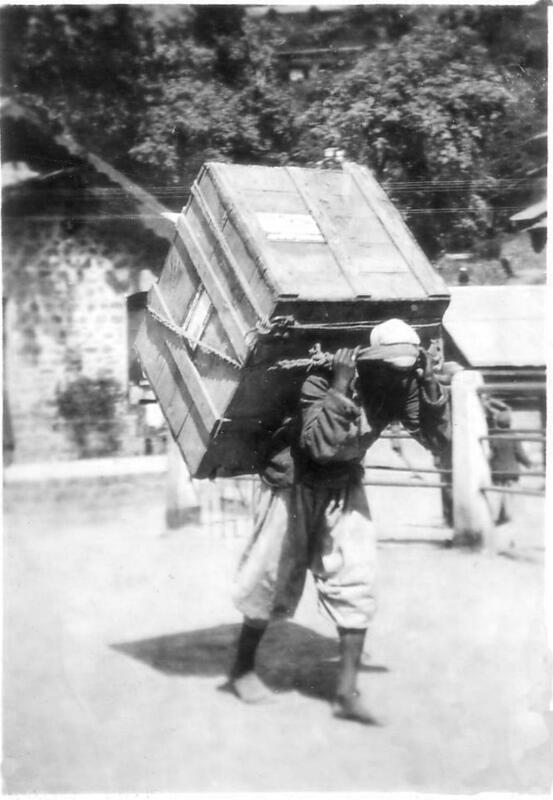 In shimla I even saw kashmiri people offering their service for hauling luggage or heavy items. May be years of insurgency forced them to earn money else where. It was in Darjeeling. I didn’t name the place originally, because I wondered whether the lady in question might be a ‘fixture’ there, but I saw no sign of her the last time I was there and I suppose she was just in transit. I’ve come across Kashmiris all over India, and I’m sure you’re right in that insurgency forced a lot of them away. The picture reminds me of Nepal, because in the mountains there most goods are still carried around that way. Oh! Good for you Mick… lol! I hope she is not reading this one here! Yes, Nepal still has tradition. In fact Nepalis have found work even in places like Kinnaur in Himachal which is apple growing belt in India. It’s Nepalis who work in fields and farms now a days. Yes, you see Nepalis a lot in Northern India, too. Just a tiny part of the continuous movements of people throughout history. I liked the woman who was the Royal.. arriving by Time Machine instead of by carriage. Now question.. was she really balmy and believed it or was she saying it for fun. Its an important question and I really need to know the answer. However, your description of her was wonderful. I liked her and wished she would appear again in one of your blogs. I suspect she was genuinely…eccentric, let’s say. And I’m sorry to say that I never bumped into her after that, so if she ever reappears on my pages, you’ll know it’s a work of fabrication. well fabrication is good. Life is always about smoke and mirrors isn’t it. Thanks, Jacqueline. I’ve just got home and had a quick look online. Once I’ve collected my thoughts (where are they…?) I’ll be over to have a look.